~Sizes 5, 6, 7, 8, 9 or 10 only. **Please note; size run almost a 1/2 to a full size small, so please order a size smaller than you normally would. i.e. : if you normally wear a size 8 get a size 9. Please make your ring selection by requesting your size in the comment box through during checkout. Thank you! 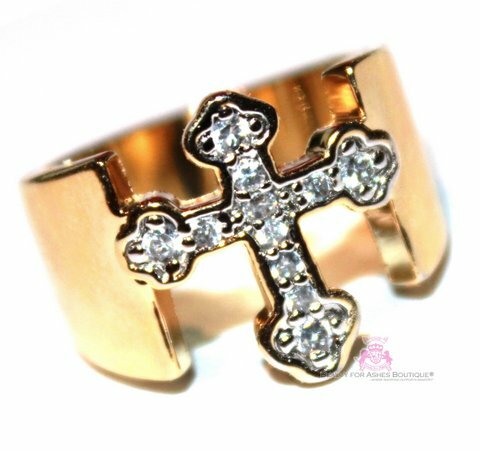 Super feminine, this Divine Cross Ring by Beauty for Ashes Boutique is dainty yet bold, with top quality clear cubic zirconias pave style embedded cross with a yellow gold surround. Base metal is solid brass. Very beautiful and classic.